This module is the heart of the system. It interfaces with the Brake Pedal Switch, the Voltage Monitor, Neutral Safety Switch and the output solenoid valve or relay. The Engine Idler has a High Idle "ON" and "OFF" pushbuttons on its front face allowing the operator to switch in and out of HIGH IDLE when the vehicle is in Park or Neutral. An LED indicator on the front face is illuminated when the engine is in HIGH IDLE. voltage. When the battery voltage is above 15.6 volts D.C. the HIGH indicator is illuminated. The LOW battery voltage indicator illuminates when the battery voltage is below 12.5 volts. 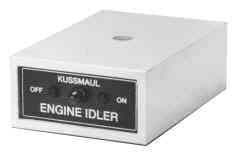 At this time a signal is sent to the Engine Idler module automatically placing it in high idle. This occurs only if the transmission is in Park or Neutral and the brake pedal is not depressed.